A black Arkansas grandmother who whipped her granddaughter with a switch is facing criminal charges, while a white Alabama grandfather caught spanking his kids has had the charges against him dropped. Norma Toussaint, 70, took a switch to her granddaughter for not throwing food away as she’d been told, according to the 12-year-old. 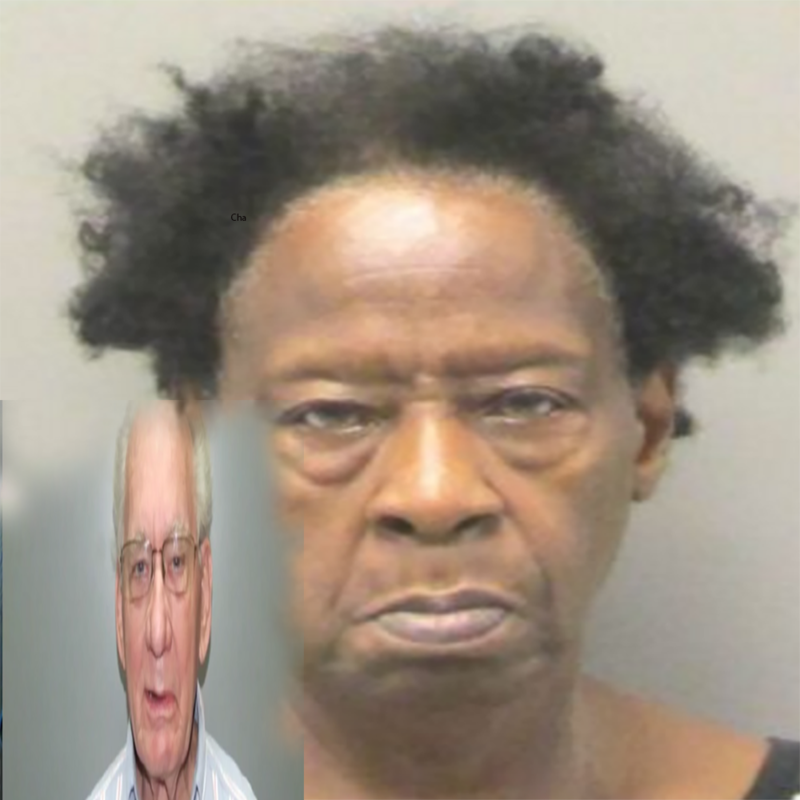 The Hot Springs Police Department arrested the elderly woman over the June 27 incident and charged her with domestic battery in the 2nd degree, ArkansasMatters reports. Toussaint’s granddaughter was not bleeding and her skin had not been broken. Meanwhile in Alabama, white grandfather James Chapman has been cleared of any wrongdoing after getting arrested for physically disciplining his adopted grand-kids. Someone at a local McDonald’s called police on Chapman after witnessing him get physical with the kids on June 29. Since surveillance video didn’t capture Chapman being unnecessarily rough with the kids, he was let go. “I was done unjust. I should have never been arrested but I was,” Chapman told KXAN, speaking as if he were a martyr just back from the Mount. Chapman says from now on he will be “very careful” about disciplining the kids in public for fear of arrest. More injustice please………and more bloodshed…..How else is a hard headed people to be made to Unify 100%?…..The Caucasoid is doing & fulfilling EXACTLY what they are suppose to do! They will continue to show you until we Clean up & UNIFY! Two standards of justice in the United States is unfortunately an all too frequent occurrence when the race of the person is a factor. I trust that the Black American grandmother will be able to reverse the charge of battery against her granddaughter who sounds like got the grandmother in trouble with the law in the first instance, and the child really needs to be dealt with for creating such drama. As to the secondary part of the matter, what we know is that the 12 year old Black American girl had been confronted by a police officer for inappropriate behavior she possibly and most likely would have experienced the following: body slamming, hand cuffing, a beating or jail time in a children’s jail. Although there are respectable police, there are nonetheless some who perceive Black Americans as animals or otherwise subhuman, and who would not hesitate to disrespect or physically abuse us. Black Americans have got to fight to reverse the state statutes that have reached into the homes to control how our children are disciplined. Home discipline utilizing common sense must be allowed, unrestricted. not surprising because the reason for this is the establishment do not want black people to have any authority over anything especially their children, this is the very reason why back in the late 60s they started stopping people from whipping their children because they knew that forced integration was coming AND THEY DID NOT WANT BLACK TEACHER WHIPPING WHITE STUDENTS. Charges have now been dropped against Ms. Toussaint thanks to calls and emails to the mayor and prosecutor in Hot Springs Arkansas. If you see injustice, singing to the choir and crying about it doesn’t help. DO SOMETHING. just as Rhonda explained I am amazed that you can make $9120 in 4 weeks on the computer . visit this site…………. Makemoney10.COM????????? Can anything be done about these spammers and the B.S. non-existant job postings? Trueletter son reminds me of a saying my grandmother used to tell me. A black woman have and the white man will raise. So, what, exactly, is your point? That you are just ignorant? That you don’t understand that states are sovereign and have their own laws distinct from one another? I realize, maybe, you don’t read so fast, so I’m typing this very slowly.